In October, New York comedian Anne Victoria Clark wrote a Medium post explaining a life hack with the power to potentially bring to an end the nation’s ongoing sexual-misconduct nightmare: imagining all women as The Rock. Should a would-be harasser picture Dwayne Johnson in the place of his younger female subordinate, maybe said harasser would think twice about saying or doing something awful. 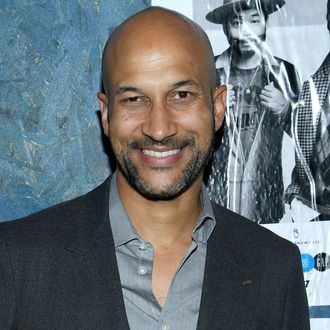 It’s a novel solution that actor Keegan-Michael Key repeated almost verbatim while a guest on The View last week. Unfortunately, he didn’t credit Clark or mention that the joke came from her widely read post, which Dwayne Johnson himself has cosigned. Clark subsequently took to social media with a Rock-level eye roll of a response. “So from now on, anyone wanting to use my jokes needs to bring $50,000 cash to my house in a briefcase they don’t tell the IRS about,” Clark posted to Twitter Sunday, along with a few other comments. After she tweeted her displeasure directly to the Key & Peele star, Key eventually responded with a mea culpa. “You are brilliant & inspiring. I love your article,” he explained. “I hope you’ll forgive any misstep on my part — all credit is rightfully yours.” Of course, if he’d been picturing this writer as the Rock, like we’re all supposed to, he probably wouldn’t have done it in the first place. Update: In a new tweet posted Sunday night, the Lion King actor says he “specifically mentioned” Clark’s article prior to his appearance…then forgot to cite it once the show went to air. That means a lot, I'm a big fan! Though I'm still confused as to why this happened. I would happily grant permission with credit or even write you new bits. I'm a freelance writer so my livelihood depends on this. I'm sure you can understand that.